Bicycle couriers have a rich history. Over the past century, they’ve delivered pretty much anything that will fit on the front or back of a bike without making things unduly stressful for the cyclist. Able to weave through slow moving traffic with agility and grace, the bicycle courier will often arrive at his destination well ahead of his motor vehicle driving counterpart. So it was a pleasant surprise to see this specially outfitted bike in Budapest, Hungary, proudly displayed in front of Miniversum, one of the largest miniature model exhibitions in the world. If you were lamenting the fact that your diorama doesn’t get out much, lament no more. 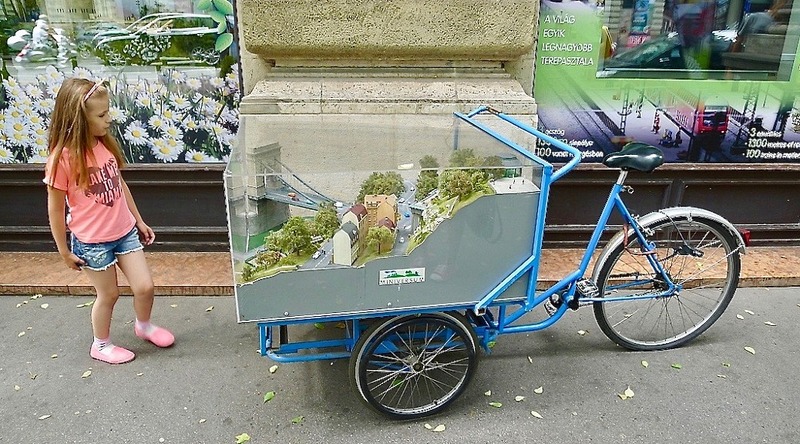 The technology exists to show off your diorama wherever you can find a bike path. Miniversum is a beautifully detailed model layout featuring famous sights and landmarks from Budapest and Hungary (and a bit of Austria and Germany). About a hundred trains run through the display, which includes 600 buildings in 14 towns, and a total population of some 5,000 miniature figures. It was constructed by 50 modellers over a 10-month period and opened in 2014. Miniversum is a must-see for diorama and model railroad fans of all ages. Details can be found at www.miniversum.hu.